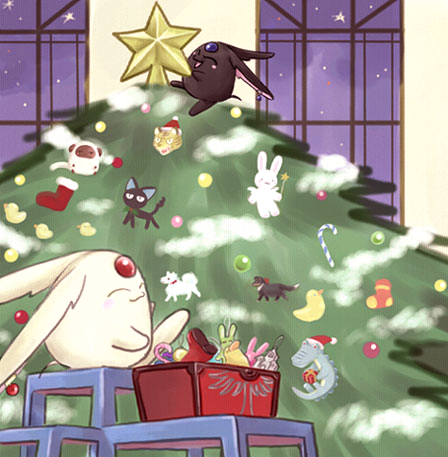 [Winter is finally here, and of course, it's holidays season as well. With the treehouses gone, Miracle Country will dress itself accordingly, with the Welcome Center, hotels, and other buildings getting snow-themed decorations, christmas lights, and other various things. You might notice that a few of the huts remain, here and there in the garden island and inside the forests - well, the usual cabins in the forest are a little cold for this season, aren't they? [As early as last month, the invitations were sent out. Now that things are more resolved, Snow’s finally making good on a promise she made a little while ago – and throwing a grand, lavish party at the ballroom. It’s exactly as you would expect a ball to be like – there’s a large dance floor, fancy music, winter-themed decorations, and a large table full of food and drink. You’re expected to dress up – but don’t worry, Miracle Country is chipping in and if it deems that you haven’t dressed fancy enough, a little magic will interfere and dress you up. It seems that the world wants to get into the spirit of things – albeit belatedly. Because there’s little mistletoe plants that will appear throughout the night and throughout the party, inside and out, to get you into the belated holiday spirit: being caught under this mistletoe will leave you frozen until someone comes along to save you. Once two people are under the mistletoe, a wall of vines will emerge from nowhere, wrapping the two up in order to give you two some privacy. Or make you hate vines. Or both. The two of you will not be able to move from this spot until you complete the task set to you. Beyond these shenanigans, you’re free to enjoy your evening – there’s dancing, beautiful scenery, delicious food, and plenty of good company. The ball will last mid-afternoon and well into the night, and the end of the party will be signaled by some pretty fireworks (a modest display, of course, as Snow isn’t made of money). [The Mistletoe event is back! The older residents might remember our magical, moving pesky little plants which forced people to do certain actions in order to become unstuck from under them. How your character decides to fulfill the condition is up to them, although the mistletoes can be picky! So no back-handed compliments or anything like that. When: Starting today and up until Sunday! The Mistletoe event is back! The older residents might remember our magical, moving pesky little plants which forced people to do certain actions in order to become unstuck from under them. You can thread together in this log, or update normally to play things out there, of course. When: From tomorrow till the 11th, and beyond 'cause we know how we are.